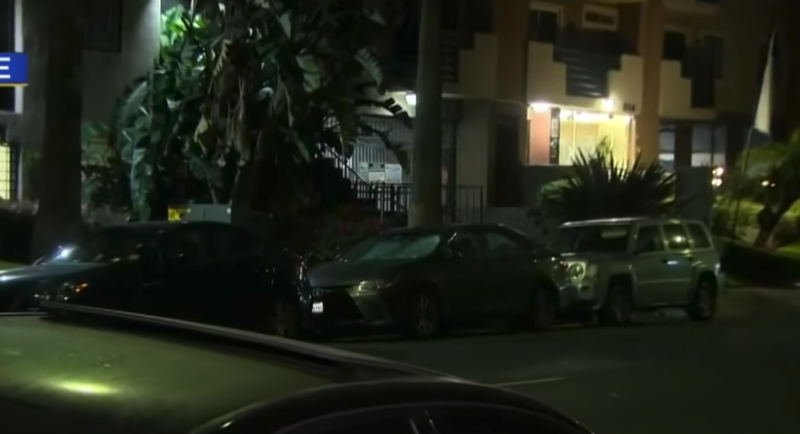 The city of Los Angeles is crowded in a way and sometimes, when you need to find a place to park, it could be a nightmare that ends in ways that are frustrating and then – a standoff begins. 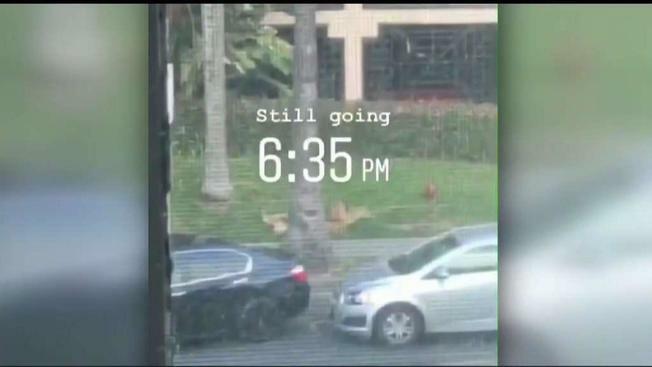 Have you ever wondered how long someone can last in a parking standoff? Well, it can be very long. 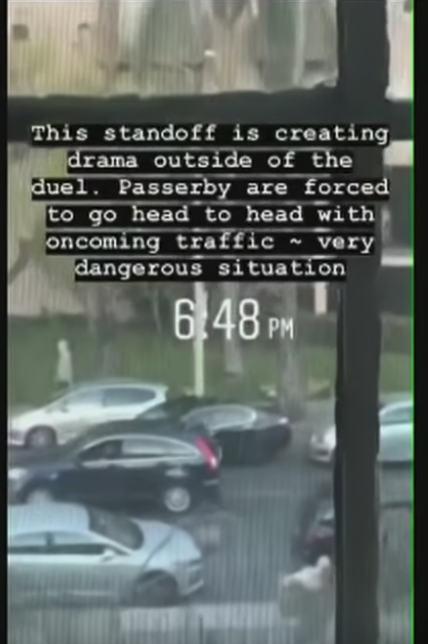 This parking standoff in the streets of LA became the most entertaining event on Twitter thanks to one woman who filmed it all. 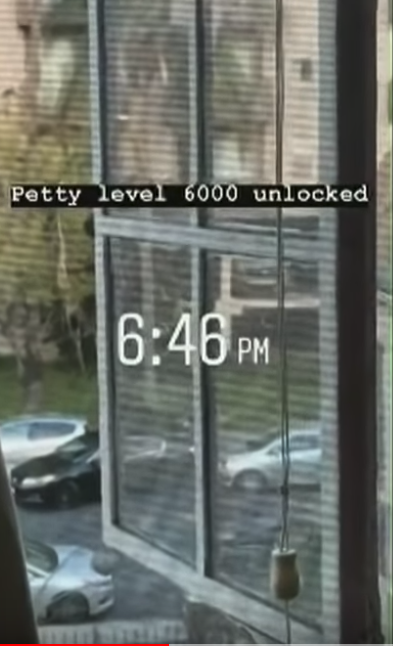 This woman documented a very petty stand-off that will leave you asking more questions about how petty people can get than you will have answers for. The evening started out okay until she noticed this saga unfold right before her. 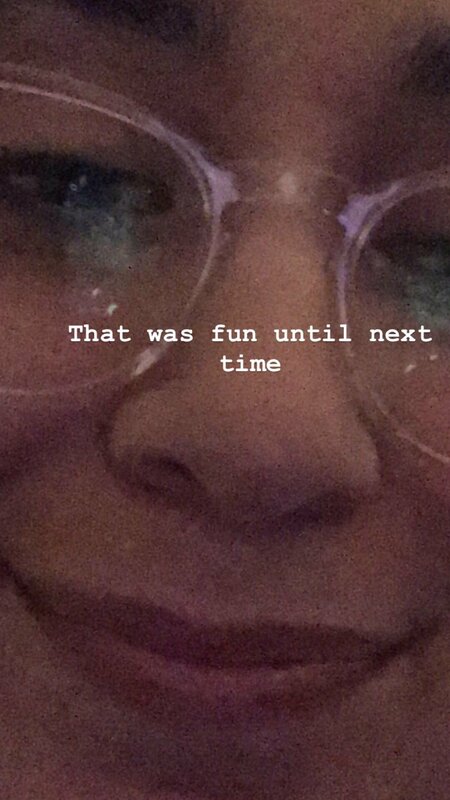 Even Crissy Teigen weighed in! So who won? During this confrontation or stand-off, there were two parties involved, of course. They inspired the teams. 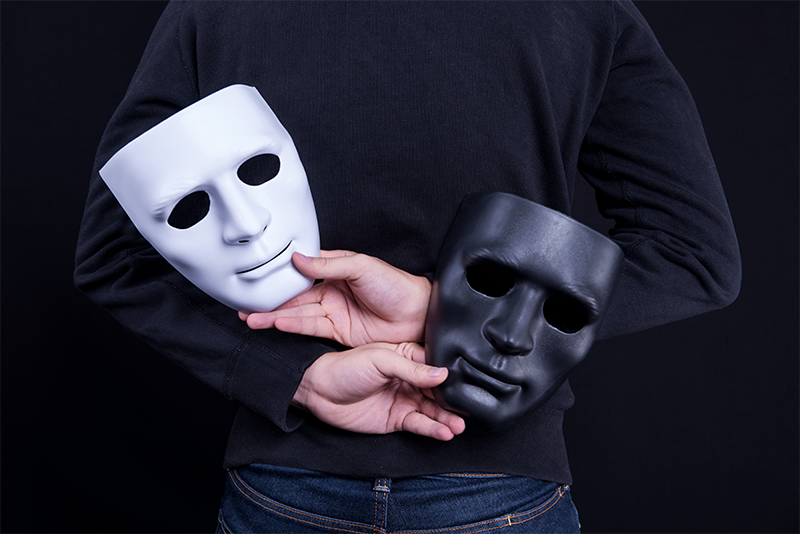 Because one of them was a Silver Car and the other was a Black car, people got behind the person that they felt was in the right and that is how this whole thing became an internet phenomenon. This happened on April 1, 2019. 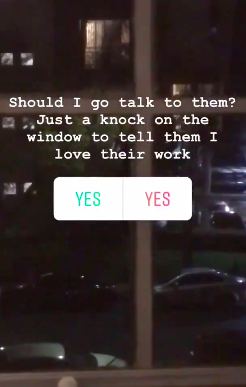 The woman who documented this witnessed this face-off from the window of her apartment. Therefore, she had a vantage point from which to watch this without it becoming too hard to document. 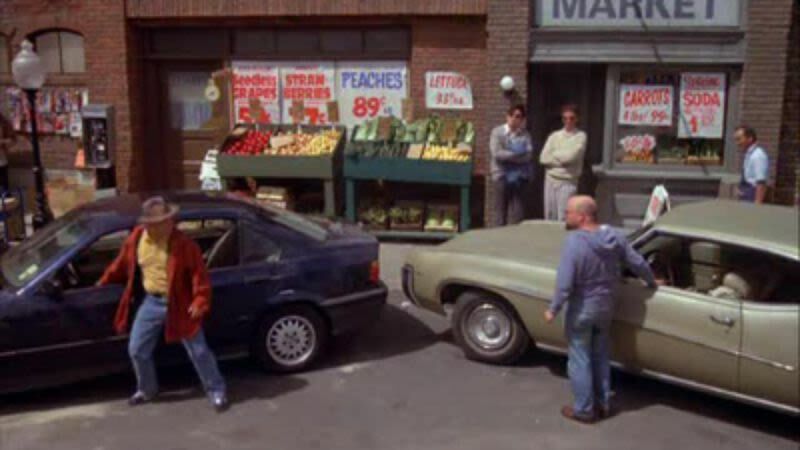 The black car and the silver car were in that stand-off for much longer than anyone needs to be in a stand-off. She was there to tweet it all. That is how all parking quarrels start. There is one parking spot and two people who want to get in there. They are both convinced that they have the right to be in there and they will do a lot to make sure that they get into that spot. The two cars were out there with both of them partially in the space. They were not budging and the drivers were not trying to confront each other directly. They just sat there and blocked each other. They just have had nothing to do that day. 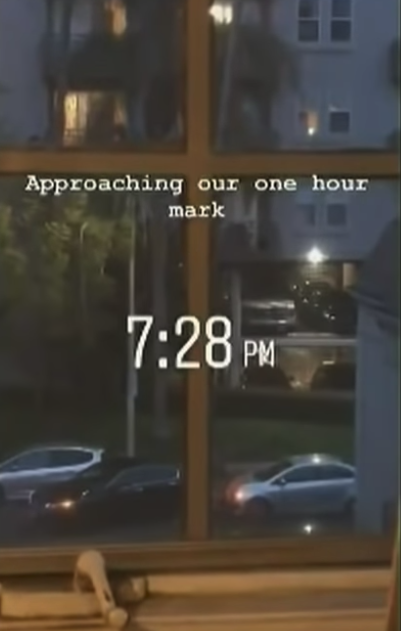 There was still light outside because it was still 6:00 PM when they started this standoff. It would take a long time to finish. The thing started like all standoffs in parking lots do. There were two people who both thought that they had the right to park in that spot and they were not budging. Normally, there would be one hard headed person with a little bit more sense than the other. This person will normally get out and look for another spot or argue first with insults and then leave. That is now what happened here. 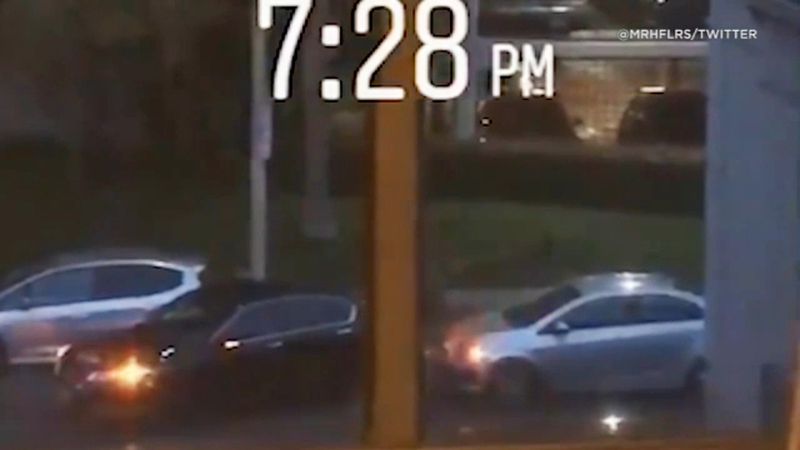 These two people decided to let their pettiness and cars battle it out to the end. Chicken Tikka realized that this standoff was beginning to get out of hand when she noticed that these two were not going to move or even face each other. As we said, they decided to let their cars battle it out. That is how they ended up honking at each other in the most obnoxious way possible. They created an annoying symphony of horns that filled the air and drew even more attention to what they were doing. 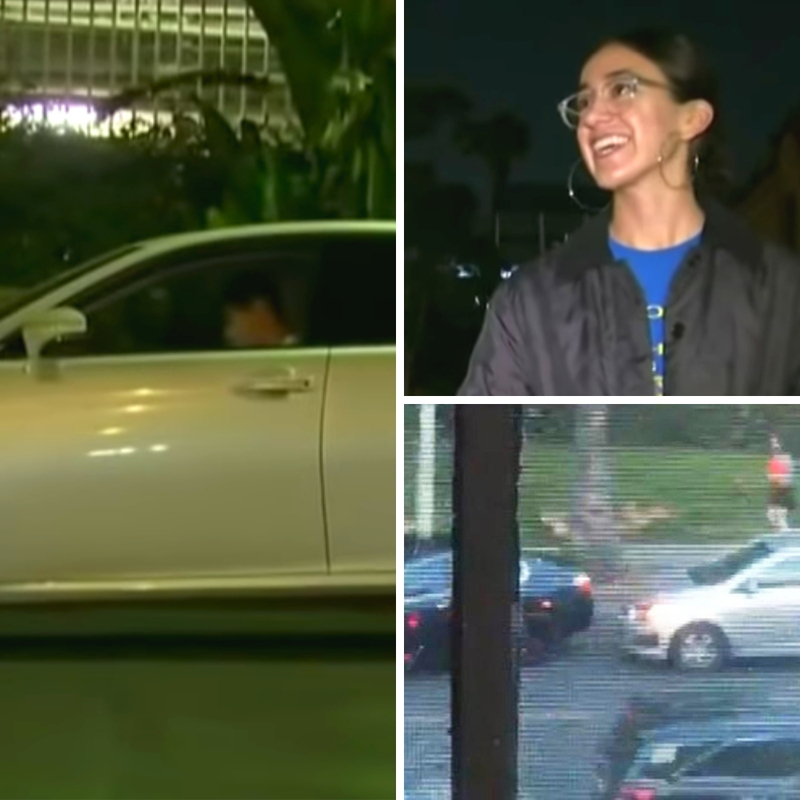 You would think by this time that one of them would have gotten out of the car and physically threatened the other or something equally ridiculous. However, they both stayed in their cars and decided to just make noise at each other. They were taking up excessively much time to resolve this. The pettiness was starting to come to the surface as everyone was wondering when this would all end. After a while, even a spectacle like this one will get old and bother other people who are around. That is what happened with these two. Silver car and Black car were beginning to be annoyed and the audience was being drawn in as people tried to see if there was an end to it. They would stop and then leave after realizing that the drivers were not in much of a rush. Then, the rest of the drivers on the road that day became annoyed by all this and started displaying their annoyance. They were realizing that this thing was no longer entertaining and that these two drivers were obstructing the road with their silly pettiness. It became apparent after a while that this whole standoff had nothing to do with finding a place to park. It was all about winning or losing, basically all about the principle. Who would back down first? They wanted that parking spot. Other spots were starting to open up but none of them made a move to go to the other spots. This was beginning to very clearly become a higher level of pettiness than anyone had anticipated. What was next? Blows and kicks? No one knew. 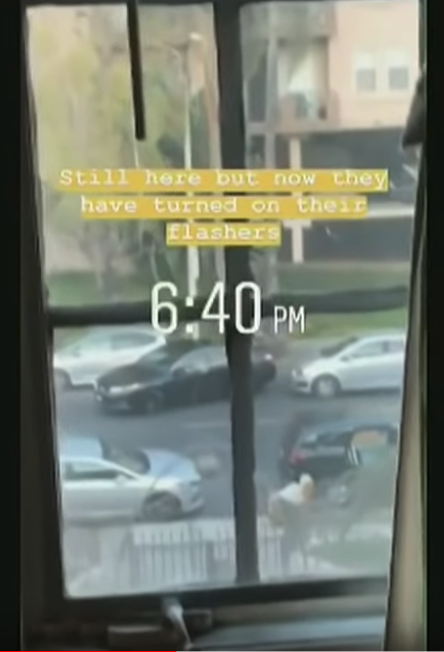 The one person who has a continuous thread of the chain of events as they happened is a woman who was filming from the window of her apartment. Mariah kind of walked into this happening. She found it in progress but it had not been going on for long. Her evening was open so, she decided to do some filming. She got the sense that the black car was the one who was right, and had a whole theory about it. They weren’t going to back down so neither was she. This standoff kept on going with none of the two drivers doing anything to escalate to a different level. The people in the car who were both angry by this point just settled into frustration and decided to just stare for a while and then move on. The people who had to watch the whole thing are the ones who live nearby and had no reason to move their cars at this point, their day was over but these two were just getting started. Their pettiness was getting to be a bit much. The sun went down shortly after. We assumed that this would not last that long either. 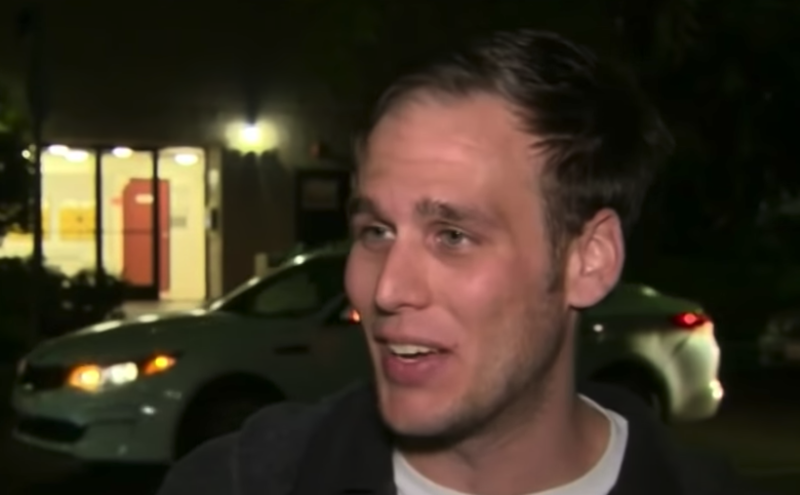 These two drivers managed to prove us wrong. Black car and Silver car were not making any attempts to move at all. It was apparent that they were sticking to their gut in this standoff when the whole incident hit the one-hour mark with no end in sight. Waiting for someone to leave for ten, twenty or even thirty minutes is a bit nuts but this was crazy. 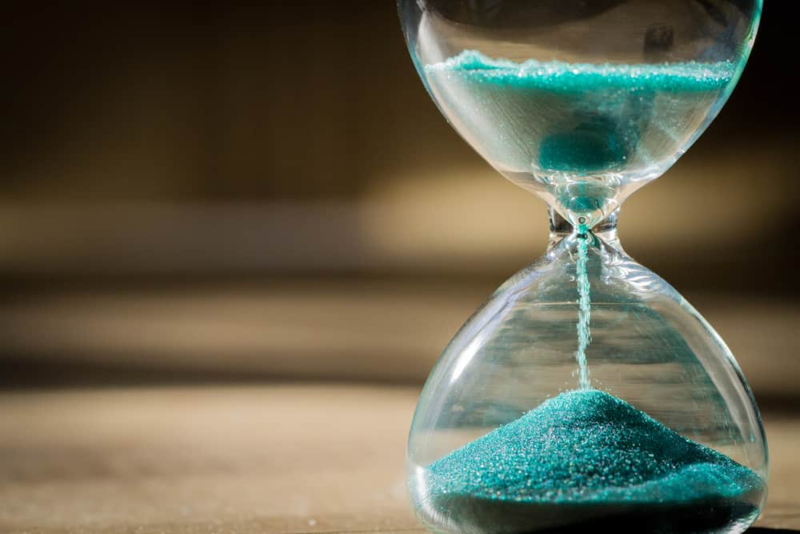 When things like these happen and the two people involved do not want to relent, usually, there has to be a third party that will expedite the process to make sure that some form of meditation brings an end to this. 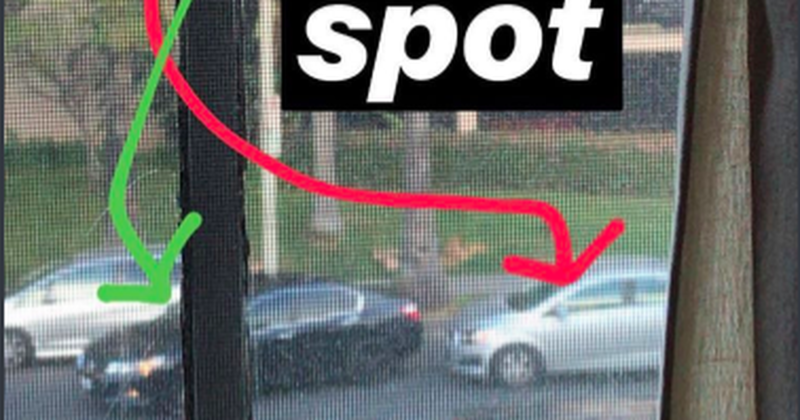 So here joins the petty part a man who just so happens to be taking his car out in a spot nearby. Will they move? So, when the car in front of these two pulled out, it looked like they would be done very soon, Just park and then go on about their business, right? Well, maybe…or maybe not. Mariah says that after one hour of doing this, the car in front of them pulled out and that is where the story arcs and mutates into something different. The cars now had space to just go and both park in different open spots. Silence. No one moved an inch. But then, they didn’t do what you would imagine anyone would do after an hour wasted in a meaningless standoff. Didn’t these two just want to get on with their lives, the day was nearing an end. All was still, no one drove off anywhere. Even with the open spot. There was the issue of pride. You see, when they were having their moment during the standoff, their pride prevented them from seeing this as anything other than a clear-cut win or lose situation. After it was all over, they saw what was really underneath it all. The selfish pride, the childish acts, and the embarrassment must have overtaken them. Therefore, they sat in their cars and did not come out for a long while. By a long while, we mean they stayed in their cars for another full hour. This was the craziness of the situation. Who knows what they were thinking? 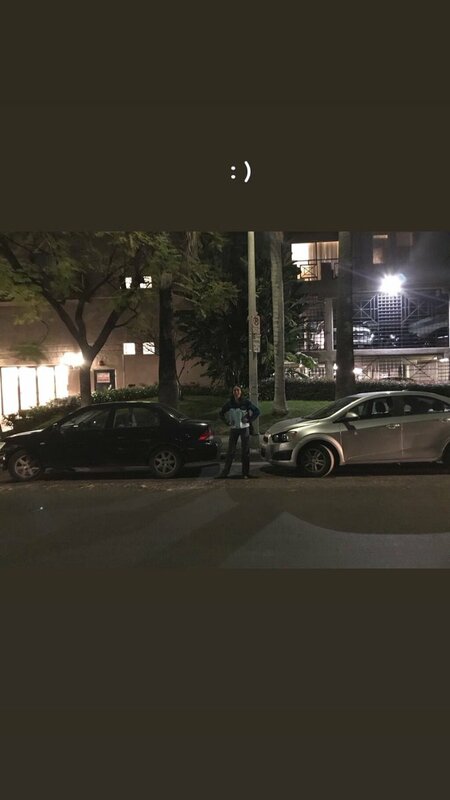 They must have been too embarrassed to walk out of their cars because they probably thought they would end up confronting each other and what would they then say? It would be purely awkward and cringe-worthy. The whole thing was bad as it stood already. As she sat in her apartment keeping tabs on the situation, Mariah debated on something that could change the whole game. In her mind, she thought that maybe, she would go over to their cars and talk to them about what just happened. Maybe, she thought, she should go and thank them for the cringe-worthy entertainment that they had provided that day. But she figured they might not appreciate being mocked like that. As she sat in her apartment thinking about this, she was also setting up ground for people to debate on who would win and who would lose. She made up the teams and asked people in a poll which team they were going to be rooting for. 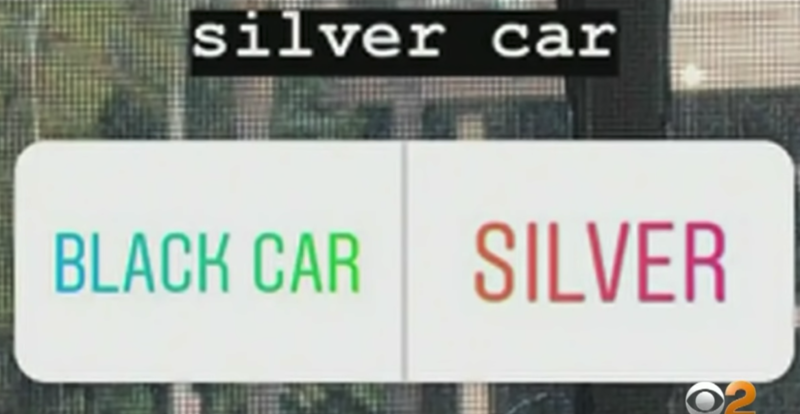 She also mentioned during this that people who chose the black car were smart. It would seem that he had been doing the logical thing instead of Silver. The people who were following this thread also waited with bated breath and incredulous expressions, we imagine, to see who would get out first. Who would drive off first after the two hours of embarrassment and petty behavior? 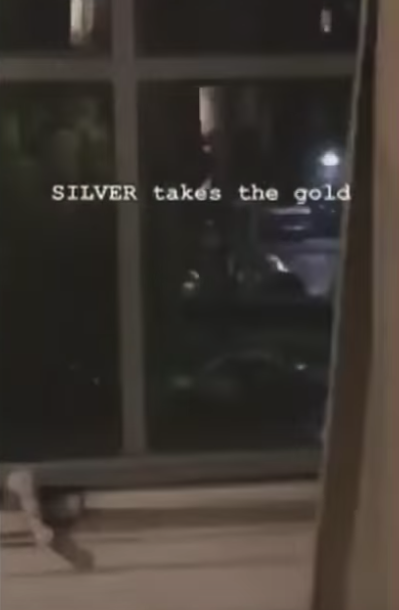 As they waited, Silver turned on his car and zoomed off. He took the gold on that one. He may have been wrong about parking space rights but he had things to do, maybe. Mariah took pics of the scene by standing between the cars because she found this to be so entertaining. Truth be told, it must have been entertaining to watch the honking, the pettiness and the subsequent sitting in the cars for an hour. Mariah wanted to have this photo for the fans who were now accumulating to make sure that they were as close to the situation as they could be, over the phone. Mariah was pretty invested in the outcome and like many of us, she was curious to know why they had to go through all this. 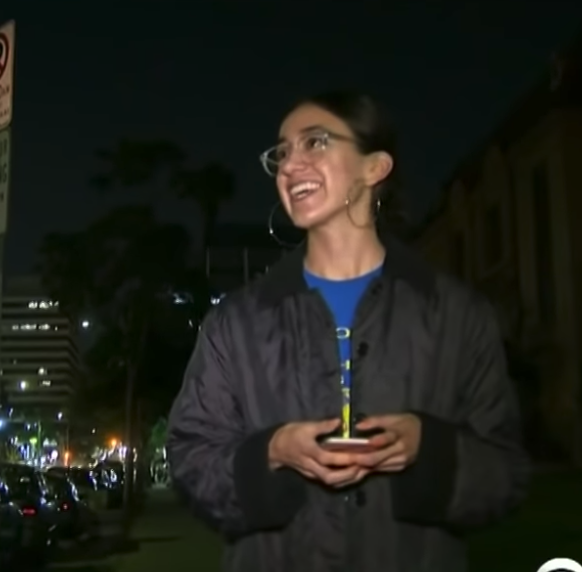 She left them each a note on their cars before they left, thanking them for an hour and half of entertainment that just made people in the internet cringe at the lengths that people will go to just to defend something they think they deserve, like parking space. 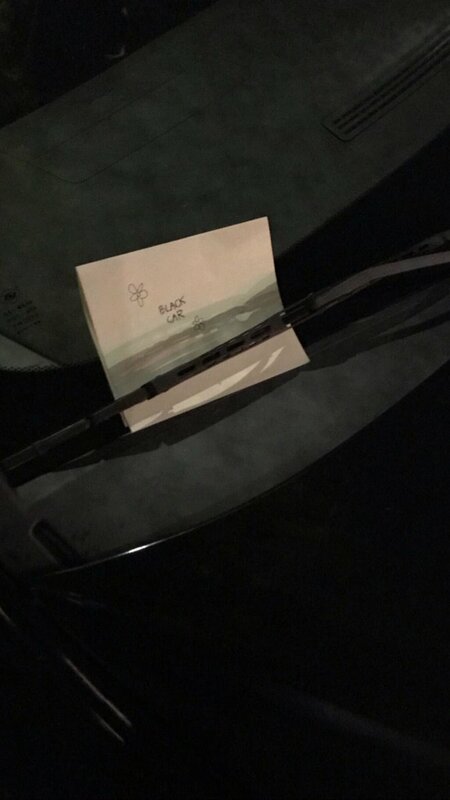 The note was not just a mild mocking of their behavior. In it, she also wrote to ask what their deal was. She wanted to know what their sides of the story were and she has not yet received any feedback for this. 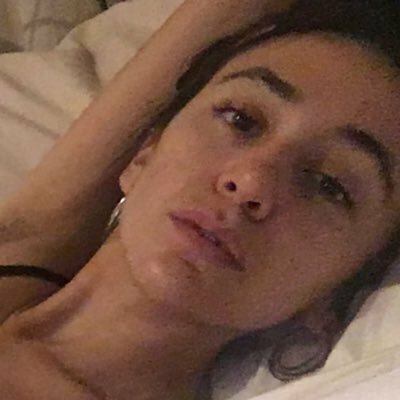 Twitter was pretty invested in this and the people who followed and commented on the story are probably still waiting to see if these two people will come out and say what that was. Leaving the email was ballsy. Someone must have taken the reply seriously because she did get a reply. There was something about the email that seemed to be fake. The email was describing a scenario that was not in the least bit likely. There is no way for anyone to be sure whether or not it came from one of the drivers as it seemed to be indicating. To date, it is considered fake. 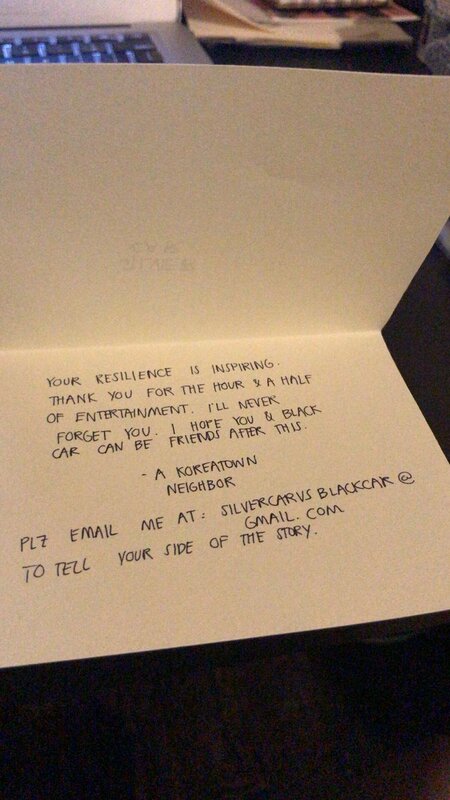 The email said that it cathe me from Silver Car. 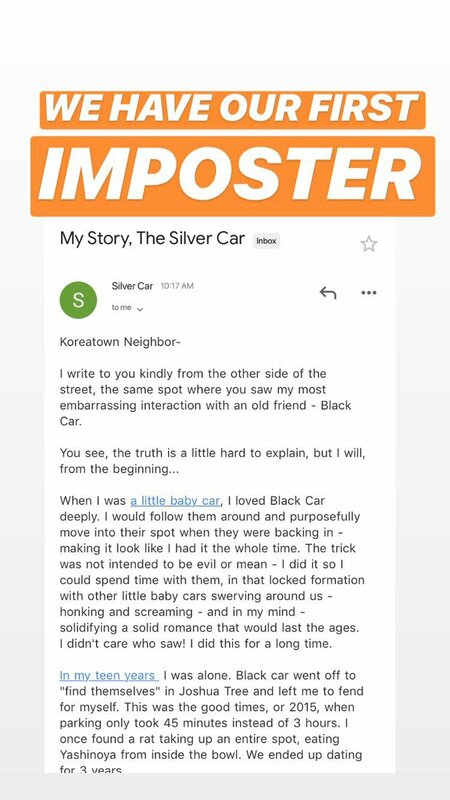 The email also said that Silver car and Black car go way back. That is a story that is very unlikely because these people went through too much for it to have been a joke. That is something that you will have to take with a grain of salt. As much as people would like to believe this, there is no evidence to prove it is a prank. The most likely explanation is that someone managed to somehow get her email and then wrote this fake letter to explain a situation that was just strange, to say the least. There is also the fact that Black car has not said anything about what happened here. The claim that this was nothing more than true affection is not so plausible. It seems too far-fetched to be real. No one would take it that far. This thing exploded and got so big that even famous model and television host Chrissy Teigen weighed in to give her opinion about it. She said that she was in support of Black driver was in the right and that Silver car saw what was happening. Black car passed the spot on purpose so he could parallel park. Silver car saw this and insisted on getting into that spot anyway. She knows that this is how it works. If you have ever been in a class about literature or something to do with arts, you may have heard the phrase art imitates life. This is true here more than anywhere else. However, this anecdote has to be reversed for you to see what happens. In this one, someone managed to remember something that was not in the minds of many people. Someone noticed that life was imitating art in this case. 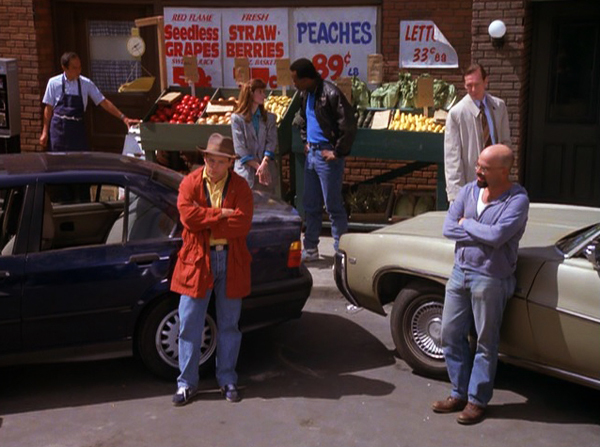 There is an episode on Seinfeld where George refuses to let another man get into the spot that he was parallel parking into. The situation is the same. Knowing how crazy George could get, he stayed there for a long time too. However, these men in Black car and Silver car were much more resilient. The circle of art is what this fan noticed. It was a clever reference that deserves applause and mad respect. As the saga was unfolding, people weighed in on it. Someone said that they could not imagine reaching that level of pettiness. The fact that one of the drivers left their car for an hour is amazing and very astounding. 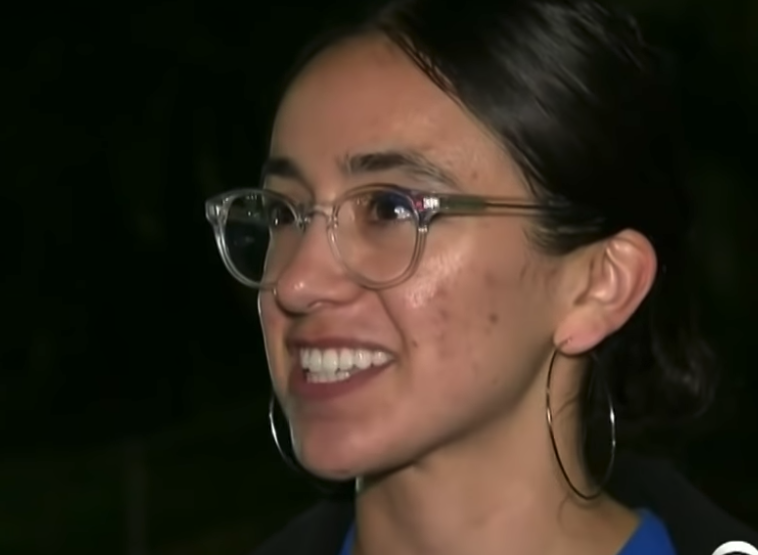 This person also said that she was surprised it did not escalate into a fist fight with blows exchanged. At the end of it all, she just found it to be hilarious. It is not uncommon to see people making fun of this. One fan even said that he hoped Netflix revives this one for a second season. It was, as he said, riveting. There is no better word to describe the events. Riveting captures it all. This was something that you had to see to believe that it was actually happening for all that time with no resolution that seemed clear for over two hours. 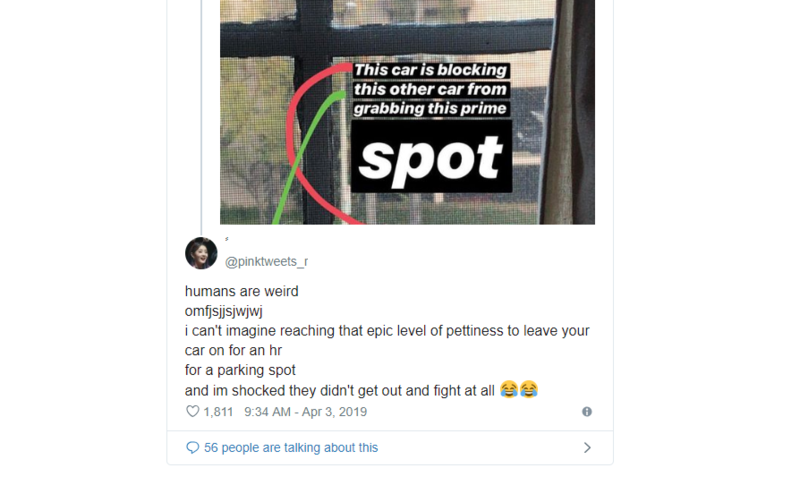 Among the comments was also someone who wanted the man who moved their car out of the way so that the two could park, be mentioned honorably. He is the real hero or as she called him, the MVP in this whole scenario. The man’s name turned out to be Mark. He was the one who brought all this to a semi-halt. If he had not moved, we wonder what would have happened. Someone else also made a reference to the entertainment industry and how this saga was like good fodder for reality TV. They deserved an Emmy, he said. Well, that is all in jest but it goes to show how great the whole thing was and how entertained the audience that followed it was. It was better than any reality show, he said. That is high praise for street shenanigans that went too far. 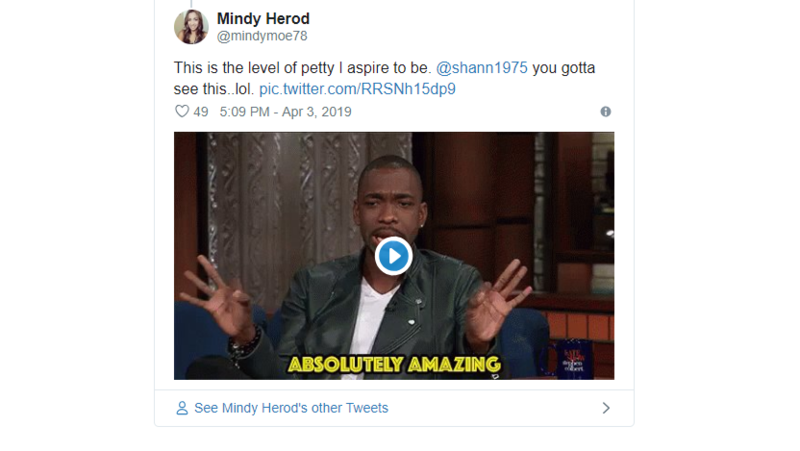 Someone named Mindy says this and shared a Gif of the comedian Jay Pharoh where he says, ‘Absolutely amazing.’ She said that this is the kind of pettiness level that she aspires to reach someday. Well Mindy, try as you may, these guys are the champions of pettiness and we doubt you will ever reach level 6000. She then shared this and asked people to come to see for themselves what was going on there. Parking has been a problem because people want to buy cars all the time because they are more convenient than traveling using public transport. The problem would be solved if people were convinced that public transport works, which it currently doesn’t. That is why someone named Vince said that we really need to invest in public transport. That makes sense. It would greatly reduce that traffic and make scenes like these disappear for good. 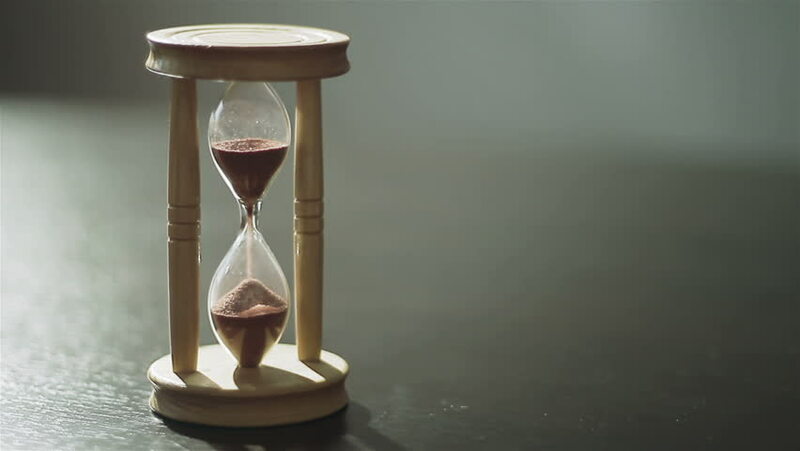 You have no doubt seen people who were patient. They may have had to endure a lot to get what they wanted but they stayed true to their course. It takes a different kind of patience to be in a petty argument and then stick to your guns to whatever the end will be. That is something that is not admirable in the least bit but when it is entertaining, it is entertaining indeed. People were actually very happy that Mariah had seen this and decided to share it, It was very entertaining for everyone who was involved because they got to vote for the cars and have a discussion that has tons of jokes and all sorts of comments that made the day. 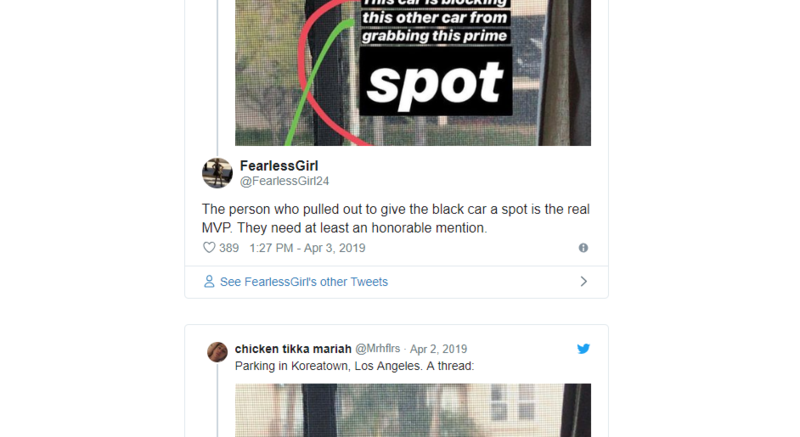 This story about parking in Los Angeles got a lot of people talking and really highlighted a problem that is in dire need of fixing. These people had literally waited for over two hours to get a parking spot. That is some serious resilience. If that is so important to them it would be interesting to know how important something more critical to their lives is to them. 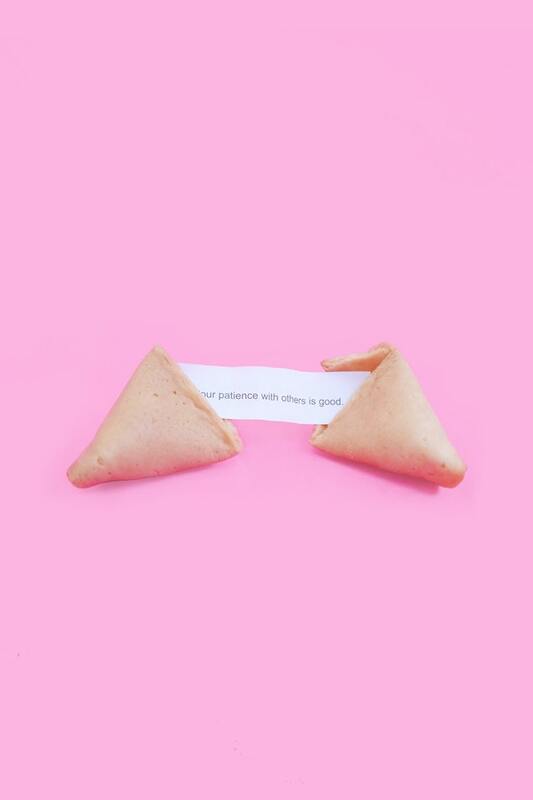 They should teach us all a lesson about patience. Even the little things matter to them. 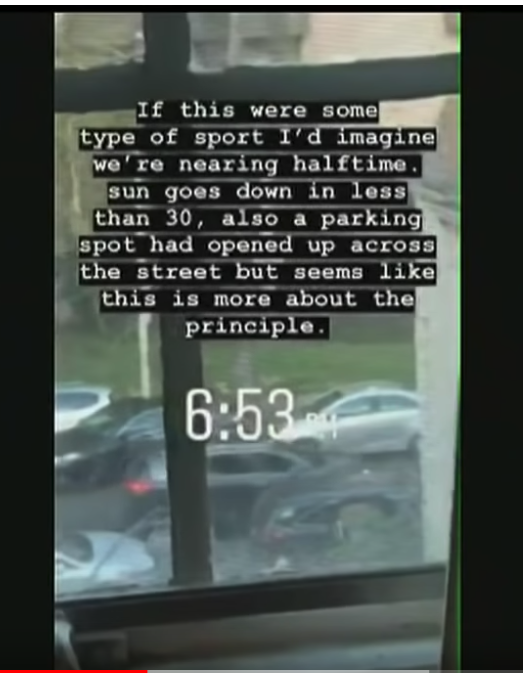 No we’re not saying you should sit two hours for a parking spot but try to think about how much patience or lack thereof you have in your life regarding things you want. As we are headed for the third industrial revolution, there is a need for us to start thinking about the way that we travel. We cannot sustain anything if everyone wants to buy a car. At some point, sagas like this one are what we end up with. We can come up with plans on how to share cars and use public transport by making sure that it is made more effective than it is now.